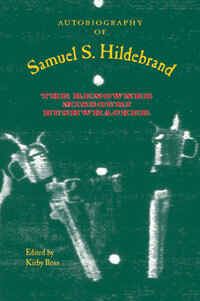 Missouri native Sam Hildebrand, one of the state’s most notorious guerrillas during the Civil War, survived the conflict and, although illiterate, had his story taken down and published. The UA Press has brought that story back to modern-day audiences with a new edition featuring notes by Kirby Ross, a journalist, author and historian. Hildebrand’s reign of terror lasted for more than seven years, giving the Union army fits and keeping much of the Trans-Mississippi, especially Missouri, in turmoil. He and his men killed dozens of soldiers and civilians, and he was accused of many heinous acts. At times whole battalions of Federal troops were dispatched to hunt him down. The bushwhacker’s history has historical significance, but his story is also readable and stands on its own as a cold-blooded portrait of a violent time in American history. The original autobiography was published in 1870 but it has long been out of print until Ross and the University of Arkansas Press created this new edition. The book includes a bibliography of sources Ross used to examine the facts behind Hildebrand’s words. The book will be a delight for both Civil War historians and enthusiasts.